Enjoy the traditional puffed pastries minus the guilt. Avarya brings you the familiar taste of Khari in a diet version, which keeps all the flavours intact to give you a feeling of fullness. This diet Khari is an ideal snack for the midday hunger pangs when you crave something tasty and crunchy. Diet Khari	BK-KH-1371 Enjoy the traditional puffed pastries minus the guilt. Avarya brings you the familiar taste of Khari in a diet version, which keeps all the flavours intact to give you a feeling of fullness. This diet Khari is an ideal snack for the midday hunger pangs when you crave something tasty and crunchy. Wheat Flour, Edible Veg Fat & Iodized Salt. The shelf life of Diet Khari is 60 days. Hungry at an odd hour? 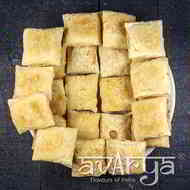 Eat these s from the house of Avarya and say goodbye to your hunger. Feel the crunchiness in every bite accompanied by a cup of tea. Give the best evening snack to your family and friends with our special amul khari.